AVS Medical is pleased to announce that NextGen Office has partnered with CoverMyMeds® to offer a free service to our providers to electronically process prior authorizations for medications. CoverMyMeds’ electronic prior authorization solution streamlines the medication prior authorization (PA) process, connecting providers, pharmacists, and health plans to help improve time to therapy and decrease prescription abandonment. Electronic prior authorization is an electronic process established in the National Council for Prescription Drug Programs (NCPDP) SCRIPT Standard that enables patient and drug-specific PA criteria and a real-time approval for medication prior authorization. What is the ePA process? 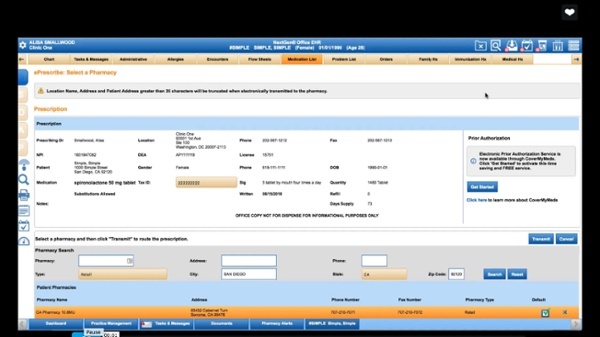 Your practice is now able to send ePA requests for prescriptions to a payer directly from NextGen Office EHR instead of faxing or using a third party. Why use the ePA process? The ePA process minimizes the hassle associated with prescription prior authorizations. You and your staff can proactively fill out the ePA request form immediately after signing an order instead of waiting for communication from the pharmacy that a prior authorization is required. Watch CoverMyMeds in action in NextGen Office! Still have questions? You can Also Visit the CoverMyMeds website HERE!